123Greetings / Help Home / Connect / I haven't received any email to verify my account. What should I do? I haven't received any email to verify my account. What should I do? In case you do not receive the email please check your Bulk/ Spam mail folder. It is possible that owing to various online filter settings this mail might go to your Bulk/ Spam mail folder. A simple way to address this situation is to add "ecards@123greetings.com" to your Address Book or list of contacts. - Under My Page tab you will find a message as shown below. - Click on the “Resend Verification email” link and a verification mail will be sent to you instantly. - You may also request for the verification email from other pages also as shown in below screen shot. - Click on “Re-send email” button and a verification mail will be sent to you instantly. - Click on the link provided in the mail and your account will be verified in our system. 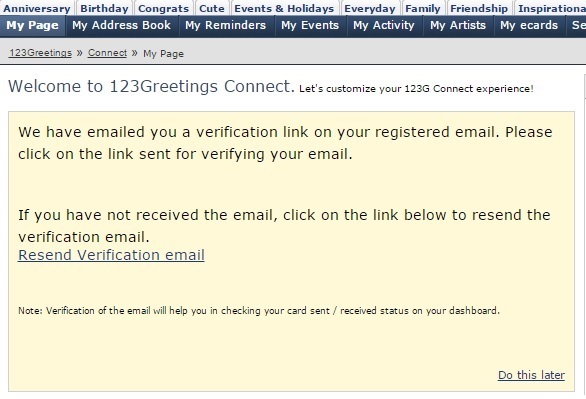 Whom should I contact if I face a problem with 123Greetings... Why do I need to enter Date of Birth during sign up?